In my review of The Lovely Bones, I wrote about the difficulties associated with depicting the afterlife on screen. The select group of films which manage to pull it off take one of two approaches: either they approach the subject in a manner which is fantastical but fleeting, or they characterise the next world as mundanely similar to the one we inhabit now. 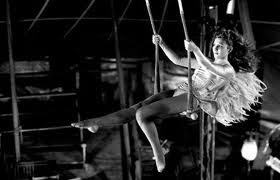 In Wings of Desire Wim Wenders gives us the best of both worlds, resulting on one of the most touching and moving films of the 1980s. Although he only began making documentaries late of his career, Wenders' approach to filmmaking is rooted in key aspects of the documentary tradition. He has the same attitude to people as Lindsay Anderson or Krzysztof Kieslowski: in depicting and recording their actions, he is completely understated and entirely respectful of people as they are. There is a further similarity to the British New Wave in his impressionistic use of voiceover. Not everything that is spoken is subtitled or attributed to a given individual, as in Anderson's short film Every Day Except Christmas, which looks at Covent Garden flower market. 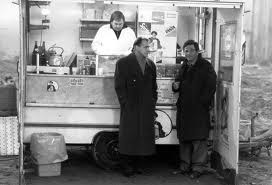 As with the British New Wave, or more recently Terence Davies, Wings of Desire is a film which understands the level of gravitas which can be achieved through shooting in black-and-white. The film is shot by Henri Alekan, who also shot Jean Cocteau's La Belle et La Bête. There is none of the mystical manipulation of shadows from that film, but the film picks up on every wrinkle and slight smile on the actors' faces. The evocative and deeply elegiac visuals were achieved by rather unusual methods; Alekan draped an antique silk stocking over the camera to act as a peculiar filter. 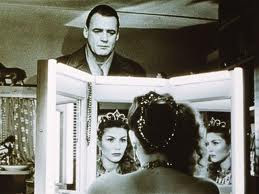 The central idea of Wings of Desire is that of angels wanting to be human. 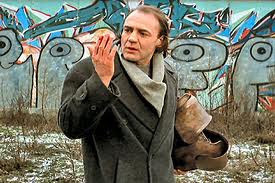 Damiel, played beautifully by Bruno Ganz, spends the film yearning to experience mortality - not as a path towards death, but as the physical sensation of being. He has long speeches in which he lists actions which seem trivial or odd to us as if they were the most valuable commodities in the universe. His love and affection for humanity is matched only by his desire to understand it, and becoming human is a way of manifesting or achieving both. 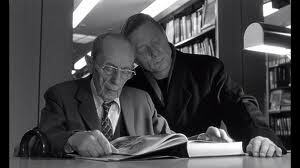 In this intriguing premise, Wings of Desire takes a very interesting position on spirituality. In the first instance, it inverts or subverts people's impressions of heaven. The traditional worldview, upheld by much of Christianity, is that life is full of hardship and suffering, but when we get to heaven all such suffering will be allayed and we will understand what life was all about. But in the black-and-white world which they inhabit, it is the angels who are suffering or cursed, as they stand frustrated by their shadowy essence and perplexed as they attempt to unravel human existence. The people, meanwhile, while not permanently ecstatic or without worry, are more or less content within themselves. They have contentment even if they cannot explain or vocalise it - or if, in the case of the trapeze artist, contentment is to be found in loneliness. 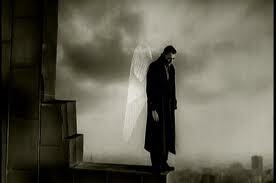 Following in the tradition of A Matter of Life and Death, Wenders shoots the scenes involving the angels in black-and-white while keeping the rest of the world in colour. In a subversion of 1 Corinthians, the angels' view of life is like a "poor reflection" of what life really is, and their striving towards reality is played out on one level like a detective story. Early on there is a scene of Damiel and Cassiel sitting in a car swapping notes like detectives on a stakeout. They invoke Philip Marlowe (Raymond Chandler's protagonist) and list random observations which seem completely unconnected, like clues in a case which seems impossible to solve. There is a further echo of this in the role of Nick Cave and the Bad Seeds. Near the beginning of the film the trapeze artist plays an LP of 'The Carny', which is followed by a performance in black-and-white by fictional band Crime and the City, whose singer writhes around like a young Nick Cave. 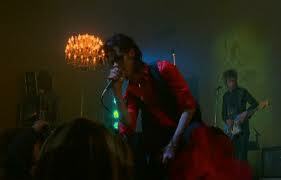 Towards the end, the Bad Seeds themselves turn up in colour with Nick Cave singing in full voice. Guitarist Mick Harvey appears in both line-ups, reinforcing the theme of poor reflections. In an unusual blend of Christianity and humanism, we hear reality at the expense of seeing it, then we see the imitation as seen by the angels, and when Damiel is made human, we arrive at reality with all of our senses. 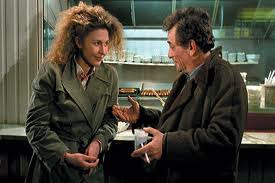 A related aspect of the relationship between the earthly and the ethereal is found in Peter Falk's character, an actor playing an investigator in the film-within-a-film. Aside from his improvised conversations on the movie set, and his various 'private' thoughts about the part, Falk gets a couple of scenes at diners where Bruno Ganz is in attendance. On both occasions Falk uses the line, "I can't see you but I know you're there", and Ganz gives a slight, welcoming smile. There are three possible interpretations of these scenes. The first is that it is all coincidence; Falk is simply rehearsing a line and Ganz just happened to be there and think he was referring to him, as when someone remarks about seeing an angel at the circus. The second is that he really can see Ganz and is 'in on the joke', being a former angel himself: we don't know enough about him to rule this out, but there's not much evidence for this either. The third, and most poignant, is that Falk isn't sure whether or not someone is there - but he wants there to be; the possibility reassures him and brings a sense of peace. This last point hints to the second spiritual dimension of Wings of Desire, namely the role of angels and whether or not God actively intervenes in humanity. Instead of being active agents of God, the angels are there as observers to document humanity - hence why so much of their time is spend in libraries, soaking up the wisdom which Men have accumulated. They cannot stop death or heal the sick, and their actions do not always lead to positive outcomes. When Cassiel lays his hands on a man, the man's next action is to jump off a ledge, and both he and Damiel are tormented at being able to hear people's thoughts and do nothing to change them. 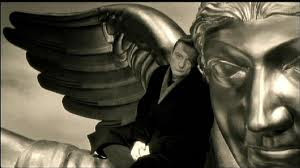 But as with Falk's character, the people in Wings of Desire ultimately find solace in the knowledge that there are forces watching over them. There is a recurring image of the angels placing hands on people - not to heal or comfort, but just to acknowledge the person's presence and that they matter in the eyes of God. Even if the Almighty isn't constantly making Himself known, His presence is a force which sustains us - it makes us feel good to be alive, even if we cannot explain why. The romance between Damiel and Marion is a beautiful counterpoint which ties all these elements together. There is the mutual irony of their predicaments: one is an angel who longs for earth, the other a performer whose profession sends her heavenward but for whom heaven is always out of reach. The scene where they meet in the bar and fall in love finds the two players meeting in the middle and sharing both worlds in a love that will last beyond the boundaries of this life. The dialogue, although rambling, has a real poetry to it which brings a sense of grandeur to what could be a very trite encounter. 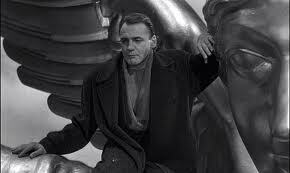 Wings of Desire is a beautiful, profound and deeply affecting film which remains one of the best films of the 1980s and a high point in Wenders' career. It is too long, with a very rambling structure, and the dialogue can sometimes be too artsy-fartsy for its own good. But those are miniscule flaws which are easily overlooked, in view of what remains an overwhelming experience.